This one is an anniversary card I made using Echo Park Love Story paper. 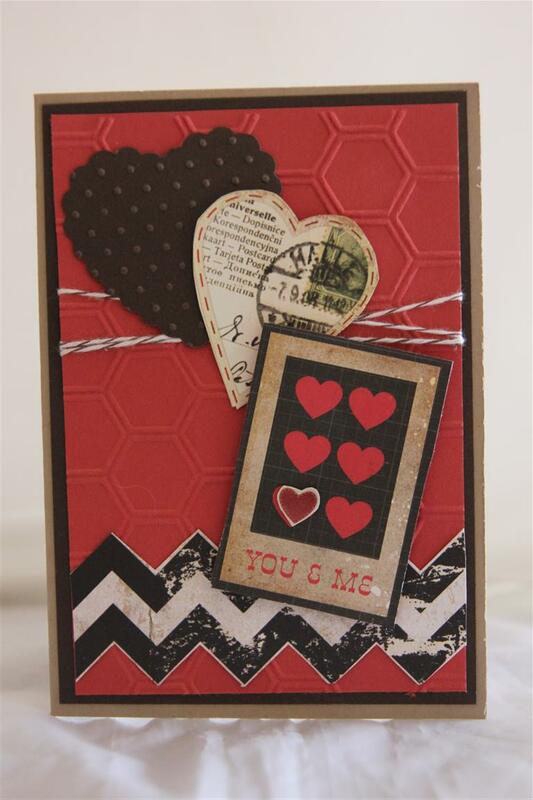 The cardstock , hexagon embossing folder and bakers twine are all from Stampin Up, and I cut the heart, sentiment square and chevron pattern from Echo Park Love story paper. I taught a lovely class of ladies this morning, always enjoy my friday classes.I bought some new papers today too – some new simple stories paper, and I am looking forward to sitting down tonight in front of the tv, and doing some fussy cutting! Til tomorrow….. 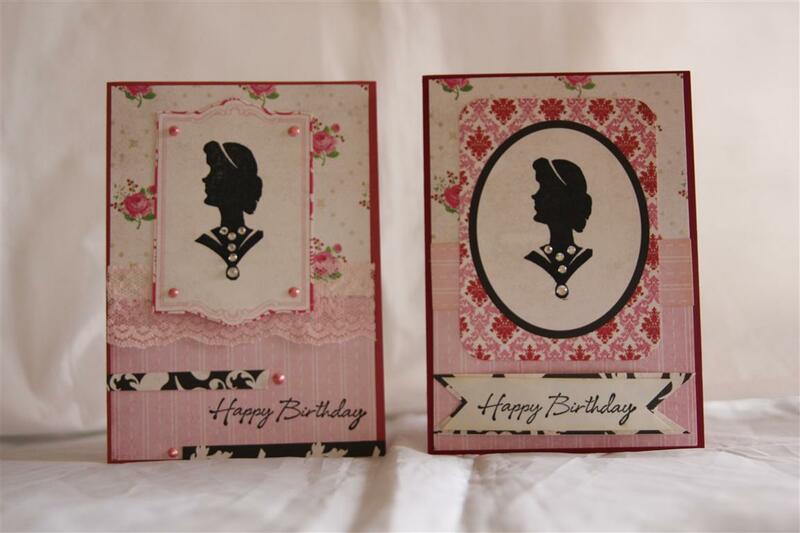 Here are the last two cards made with echo Park Love story.Although they look the same there are quite a few differences. Nathan thought we should play a spot the difference game with them, but really there are a lot! I have stamped the cameo image with a stampers anonymous tim Holtz collection stamp, and the sentiment is a hero arts stamp.I have added lace, liquid pearls, and some rhinestones as a necklace to finish.I have had a productive day in the craft room today, and cleared all my outstanding orders, as well as the upcoming family birthdays. Then for the fun stuff …. playing with some of my new purchases, and trying some new ideas. I have also done a few Easter cards – don’t let that sneak up on you everyone – it’s only 4 weeks away!Til tomorrow…..
No distressing or inking on this one, although looking at it now, maybe I should have!The patterned paper is Echo Park Love Story, and I added a doily, lace, hatpin,ribbon,flower and rhinestones for decoration. 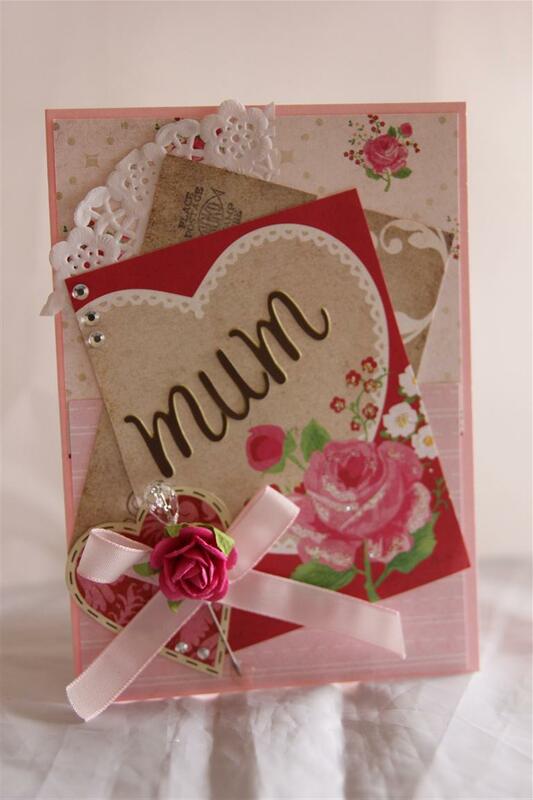 letter stickers spell out Mum. I‘m so glad the weekend is here, I have missed my craft room this week, but will make up for it over the next 3 days.I had a lovely class this morning with my ladies, such a lovely group.First on the list this weekend is a couple of orders – 80th birthday, wedding ,engagement, and then husbands birthday card – have to think about that one..it’s hot again here, so I am sure his card is going to have a bit of a beach theme happening! Til tomorrow…. Echo Park – Love story patterned paper, ansd another not quite shabby chic style. I distressed and inked all the edges of my layers, added a doily, a couple of leaves die cut using a memory box die – Meadow Leaf. Assorted flowers, and a big one made from some netting with a kaisercraft brad in the centrer,and all that was left to do was stamp the happy birthday!Til tomorrow…. 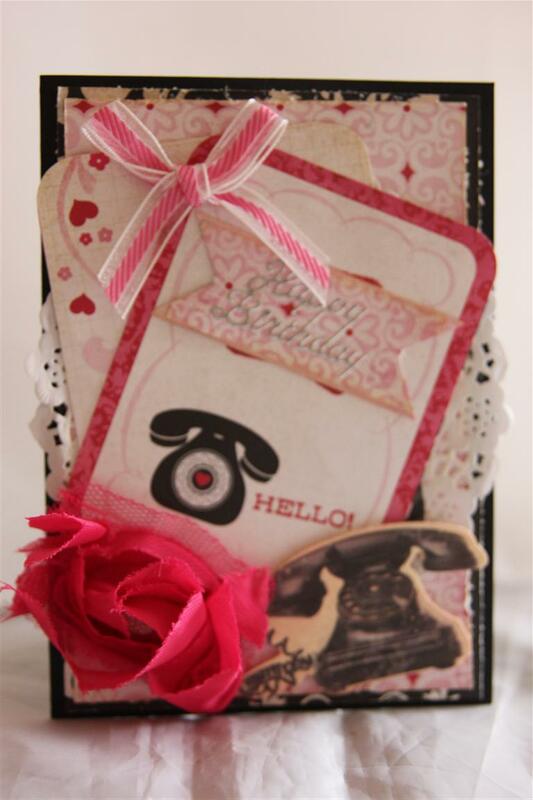 I only bought a few 12 x 12 sheets from this range of paper – Echo Park Love story – and have only made a few cards with it so far – I have put it aside for now to work on some classes, but I thought I would show you what I have created so far. 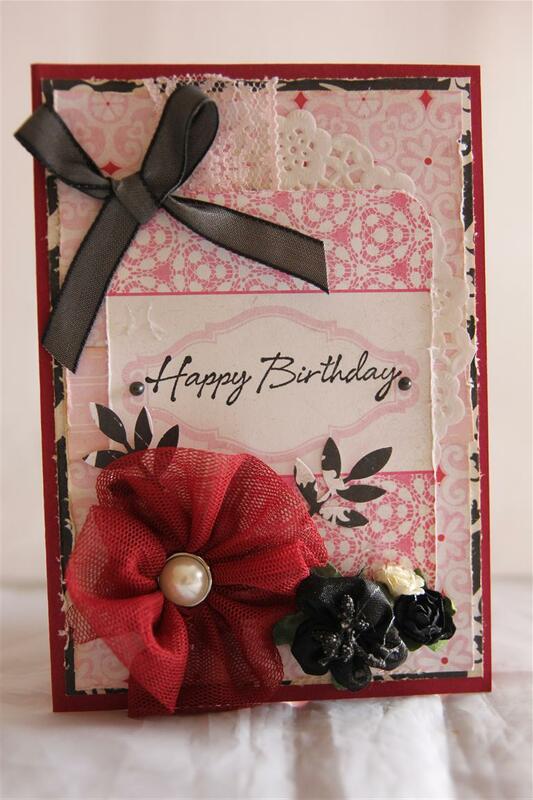 I used a base of black cardstock, and layered a couple of the papers on top – after distressing and inking the edges. 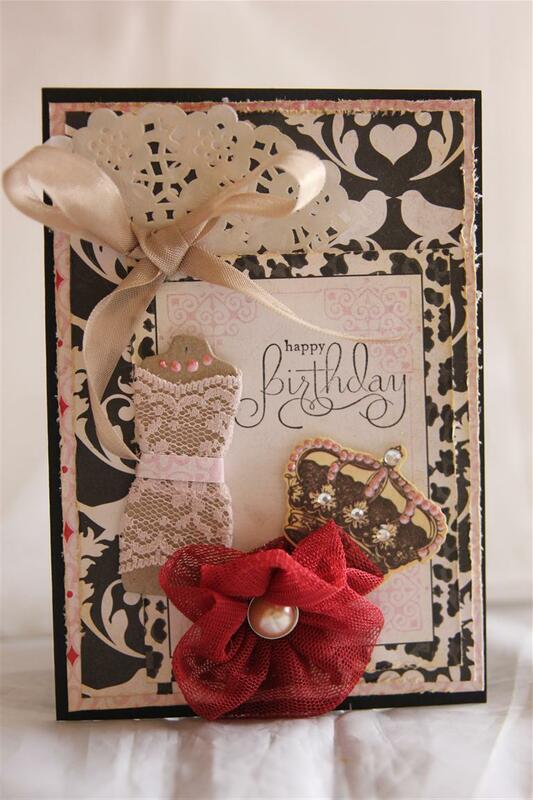 I then raided my bits and pieces drawer, and found this chipboard dress form and crown which I decorated.I inked a doily, and added it, as well as a seam binding bow. I made the flower by folding a length of netting in half lengthways and sewing a running stitch along the raw edge before pulling the thread to gather it. I threaded a brad ( kaisercraft) through the centre. These are amazingly easy to make, and I am going to sit in front of the t.v. tonight and make some more!This style is my cleaned up take on shabby chic, and it’s my favourite at the moment, so I think my ladies will be making some cards in April to this style too! Til tomorrow….